By creating a butterfly mosaic while learning about Texas Coastal butterflies and host plants, second grade students at Morales Elementary School in Houston, Texas, integrate science and art. discuss a field trip to a butterfly center. 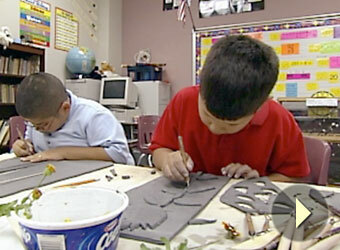 The eco-art program at Morales Elementary Afterschool is a cooperative between the school and Harris County Department of Education Cooperative for After-School Enrichment (CASE) and Artist Boat in Galveston, Texas. Artist Boat is a non-profit organization dedicated to promoting the preservation and education of Texas's natural habitats through the study and exploration of the arts and sciences. The curriculum was designed by Artist Boat in association with Morales Elementary School and incorporates the national science standards. For more information, visit www.artistboat.org. Begin by communicating with the school-day teachers to find out more about the language arts, mathematics, and science skills that are being taught, how you might help students improve specific skills, and how you might incorporate these skills into science activities. For example, a science project that asks students to measure, collect and analyze data, graph, and express scientific relationships also builds math skills. You may want to begin simply by incorporating science trade books, journal writing, graphic organizers, Internet searches, and mathematics with science investigations. Later you can think about projects that could incorporate multiple areas of content knowledge, such as a year-long study of natural disasters, a butterfly garden with art mosaics of the ecosystems in your region, a robotics competition, or a health and nutrition fair. Integrating Science Across the Curriculum works because students are engaged in their own learning; they use what they already know and construct new understandings; they are able to use different strategies, approaches, and learning styles; and they learn in a social context. The learning is not isolated, but rather it is a part of a whole. Students read The Icky Sticky Frog, practicing literacy skills as they develop an understanding of tadpoles. Identify a safe place to maintain aquaria with tadpoles. Collect materials—tadpoles, aquaria, library books, etc. Review instructions on how to set up an aquarium and care for tadpoles. For example, the kind of water you use and general care of the tadpoles is very important for their survival. Read the book The Icky Sticky Frog, and develop questions for discussion. Begin a word wall or chart of the new vocabulary words that the story introduces. Talk with children about how to handle animals and their habitats in a way that demonstrates a respect for life. Local pond water and tadpoles may be used, but take precautions to ensure that the water is not polluted. Seek assistance from local environmental resources. Identify a safe place within your afterschool facility to maintain the tadpoles. Follow guidelines for raising tadpoles to ensure safety for students and tadpoles. Engage students by asking what they know about frogs, tadpoles, and amphibians. You may want to use and record students' answers on a KWL chart and post it on the board or on a wall, adding to the chart as they learn more. Review sounds that frogs make and read aloud the story of The Icky Sticky Frog, with enthusiasm and expression. Use your word wall or word chart to review new vocabulary words. Explore tadpoles. Divide students into groups of four or five. Set up aquariums for each group, and ask students to observe the tadpoles and record their observations by writing about what they see and making drawings of tadpoles at various stages. Check in with each group and ask guiding questions such as: How do the tadpoles change as they grow? What do they need to survive? Explain observations. Ask students to explain what they learned by sharing their observations and questions about tadpoles. Have students research information about tadpoles and create a story chart to illustrate what they have learned. Extend learning if time allows. Continue to read books about frogs, build vocabulary word walls, create frog books or PowerPoint presentations based on what students have learned, and compare/contrast what students know about living things with what they have learned about tadpoles and frogs. Students use books and the Internet to gather data about earthquakes and how they affect people, and utilize skills in language arts, math and art. Identify Web sites and collect books on earthquakes, volcanoes, and tsunamis. Identify vocabulary words for vocabulary activity. Make foldable graphic organizers from the model provided. Purchase a large world map with latitude/longitude lines as well as country names. Download and duplicate copies of world maps for individual student use. Make copies of the Largest Earthquakes in the World Since 1900 (PDF, 68K). Plot the largest earthquakes and keep as model. If colored straight pins are used instead of colored dots, as suggested by some teachers, care should be taken to ensure students are not injured. Engage students in the activity by reading aloud The Restless Earth or The Magic School Bus Inside the Earth. Ask students if they or their families have experienced an earthquake, volcanic eruption, and/or tsunami. Explain that students will study and plot major earthquakes. Explore the FEMA for Kids and other Web sites on earthquakes (see the Resource page). Model plotting earthquake data using the large map, calling out the latitude and longitude as the intersection point is found, and finally placing a small colored dot on the location according to the Earthquake Magnitude Scale (PDF, 68K). Have students work in groups so that they can help each other find the correct coordinates to map the rest of the largest earthquakes. Have individual students plot the ten largest earthquakes on 11" x 17" world maps. Have teams of students download earthquake data for the past week and plot the data on the large map. Have teams take turns plotting daily data over a month or longer period of time using the colored dots on the large map. You may also choose to have individual students plot the data on their world map. Have students keep a journal of Internet searches and reflections on what they are learning. Explain findings. Once the plates are clearly visible from the plotted data, have students explain what they have learned through illustrations, writing, or PowerPoint presentations. Extend students' understanding if time allows. Watch "Ring of Fire," organize a relief drive for earthquake victims, invite a geologist to speak, plot volcano locations, or plot additional earthquake data. Explore these resources to assist in implementing the Integrating Science Across the Curriculum practice in your program. Barton, Mary Lee and Deborah Jordan. Teaching Reading in Science. Colorado:McREL, 2001. Bentley, D. and S.Yoon (1999). The Icky Sticky Frog. Santa Monica, CA: Piggy Toes Press, 1999. Honig, Bill, Linda Diamond, and Ginda Gutlohn, CORE's Teaching Reading Sourcebook. CA: Arena Press, 2000. A great way to set up a science project for your afterschool participants is to use WebQuest, an inquiry-oriented activity where learners find information on the Web. All you need is a computer with access to the Internet: The WebQuest Page provides detailed development instructions as well as templates to enable even technology beginners to put WebQuests online. But before you try to develop your own, check out the existing WebQuests to see if there is already one online that addresses your science learning needs. A WebQest can be used in a learning center with one computer or in a computer lab. When you explore The WebQuest Page, you'll find standards-based WebQuests that involve students in their own learning as they solve problems in real-world situations.